No doubt i have tons of favorite make up and picking out the best make up necessities for my travels has proven to be a feat over the years, how we wish we can bring our entire vanity set along with us every single time but unfortunately our luggage space and limited weight warns us otherwise. Pick wisely because you are gonna be taking tons or pictures/ selfies and you want to look your best at bare minimal! First things first when there is a basic solution readily available, would you grab it without thinking twice? Because i know i would, anything to make life much more easier so you can save your worrying and focus on coordinating your OOTDs instead of your make up bag. From my own personal experience it takes me quite some time figuring out what make up to bring along until i found out Althea curated a special make up box for fellow wanderlusters like us. It covers everything you need, so all you need to grab along is your foundation, contours and face powder! Upon receiving my Wanderlust Beauty Box in the mail last year in November just before my almost 2 weeks long trip to Japan and being away for quite some time usually i would bring my large bag of make up which i would most definitely only use 30-40% of its contents while the other 60-70% are "just in case" seriously bad habit lol, should stop doing that and only bring things i'll actually use! How many girls like that also? HANDS UP, I won't judge lol. So as i was saying, after they first launched the wanderlust beauty box, before it was sold out i managed to secure one (thank you fairy godmother!) and here i'm gonna share what's inside of the box that made it worth getting (like all of other Althea beauty boxes). It's a total saver as you usually only pay a minimal amount for a box filled with products worth more than what you paid. Can't express how adorable PeriPera's Mini Mini Peppy's Carrier because it's a perfect size for Barbie's luggage lol, i don't play with dolls anymore but can't help feeling like a kid getting excited over Christmas morning because how often do you even come across such packaging? I really have to give it out to Korea and Japan for always thinking things out of the box, and making sure that we girls have a flavorful experience with every new product released. Yea packing is definitely one of the key factors for a consumer's decision making so the cuter it is the higher the temptation to just grab first and regret later lol. But in this case there's nothing to regret as it contains all the products i need in minuscule size! Saves so much of space and the colors/ textures are rich so i don't need to use so much of it, just small dots all over my face would do. ink velvet (no.5 Elf like Rose) - my fav! For the rest it has a very velvety like texture which blends really easily with fingers (no tools needed) and it sets well unto the skin without any cakey finishing. Suitable for Japan's cold weather as i can't use much mattifying products there or else my skin would start cracking due to the cold and dry environment. Found the Ink Multi pretty cool because i could use it as my contour and eyeshadow at the same time, peripera really do make their products convenient especially for people on the go. For a quick eyeshadow glide with minimal blending needed for gradient effect, this only works on your natural lids without any double eyelid stickers, if you do apply stickers like me previously then it would be abit hard to apply and blend it in. Best product to prime eyelashes before applying mascara, works by lengthening and giving volume to your lashes, but i prefer to get extensions done before a trip so i can skip this step. Not a Korean brand i'm familiar with but it's waterproof, smudge free and long lasting characteristics has earned its approval on my books. Then again i personally prefer liquid eyeliners over pencil anytime as it's easier for me to draw finer liners. I felt that this product wasn't necessary in the whole package and it could have been replaced by a BB cushion instead as the texture is so light that after blending in there is barely noticeable even after 2-3 times of building over. Not a big fan at all, packaging looks cute though as it reminds me of a nail polish bottle. Comparing to the Peripera tints, they can get the job done without this fella plus the bottle is heavy and fragile (glass). 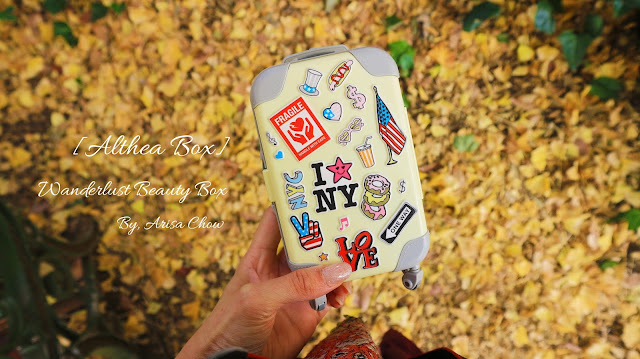 For more awesome beauty boxes, heads over to Althea to get yours today! Though this box might be sold out for now, who knows with demand they might actually bring it back and a better version too *fingers crossed*. Looking forward to be more active in beauty section again as i've been taking my time recuperating from heavy work load and mental stress. Hope you found this post useful, till my next beauty review lovelies!